Selling itself as the manufacturer with a car for every need and want, Audi has expanded its A3 range in new directions with the introduction of the Cabriolet version of its S3. Combining the performance and handling of the S3 hatchback with the appeal and open-air experience of the Cabriolet, it is one of only a handful of four-wheel drive convertibles on sale today. By virtue of its price and specification it could be argued that the S3 Cabriolet is at the top of the A3 range, for the moment at least. The range spans from the reasonably-priced entry level hatchback models all the way up to the S3, and by combining the coveted S3 badge with the folding roof it has created the most desirable model in the range. As expected the S3 Cabriolet carries over the same mechanical layout as its hatchback sibling, with the powerful four-cylinder turbocharged engine mounted in the front with a choice of manual or S tronic dual-clutch gearbox delivering drive to all four wheels. The S3 Cabriolet also retains the Audi Drive Select system which allows the throttle and steering response to be tweaked, as well as the gearshift speed on S tronic models. Underneath the S3 Cabriolet also retains the revised suspension layout from the regular S3 hatchback. That means larger alloy wheels as standard, stiffer springs and dampers as well as a lowered ride height, all designed to offer maximum grip and impressive handling. The suspension settings remain the same despite the lack of a fixed metal roof. Visually the S3 Cabriolet inherits the deep front grille, sporty bumpers front and rear and the discreet S3 badging from the hatchback version. The hood is available in three colours to allow better matching with the body colour, while the cabin benefits from smarter trim and detailing unique to S models. Combining the performance and security of the S model with the added appeal of the Convertible folding roof creates a car with a very broad range of abilities. It may not be as sharp to drive as the S3 hatch but few buyers will mind as they benefit from its open-air appeal instead. It's certainly not a cheap car but it does provide a lot for the money. Running costs for the S3 Cabriolet are the highest of the A3 range, although respectably good for the performance on offer. The initial purchase price is high for this type of car, as is the insurance, although the fuel economy is quite good for the performance available. Despite the access issues caused by the awkward bootlid, the S3 Cabriolet has a remarkably spacious boot. The rear bench folds flat to offer additional room and the roof does not impact on the size as it's stored on top of the boot. Rather than a bench seat there are two individual seats but their size dictates only children or adults for short journeys can be considered. The big screen and latest generation MMI control system make the S3 Cabriolet's controls a breeze to use, and the solidity of the switches and buttons make them a pleasure to operate. It has even more features than before yet the dashboard itself seems even more uncluttered and clean, avoiding a busy looking dashboard yet retaining a strong ease of use. Anyone looking for a comfortable car can still consider the S3 Cabriolet. The seats are excellent, providing a high level of support, and noise levels are well controlled thanks to the three-layer folding fabric roof in particular. The ride quality is also good regardless of which setting the suspension is in, and long motorway journeys can be despatched with complete ease. The canvas roof is suitably reinforced so as to prevent making life easy for burglars and in addition there is the reassurance of a Thatcham category one alarm and immobiliser. The contents of the boot are completely concealed from view and remote central locking and keyless start are standard. A high level of safety is assured with the S3 Cabriolet thanks to the impressive specification. The strong engine, powerful brakes and standard four-wheel-drive are complemented by a suite of electronic aids. There are also pop-up rollover hoops that automatically deploy in the event of the car turning over. The S3 Cabriolet delivers both high performance and handling whilst mixing in the pleasure of open-topped motoring and still without compromising too greatly in terms of comfort and refinement. The 2.0-litre turbocharged engine and dual-clutch gearbox work smoothly and efficiently together, and when extended it accelerates with real vigour. Cabriolets have an obvious appeal to small family members but unless they are old enough to get into the back seats and strap themselves in, the lack of a pair of rear doors will become tiresome in time. Although the boot is well-sized its narrow aperture means few buggies will fit. 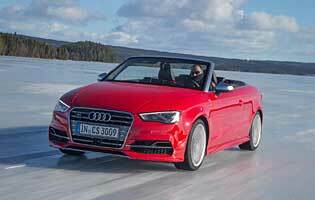 The S3 Cabriolet is likely to be outside the reach of most new drivers, given its price and insurance costs. It is however easy enough to drive for the inexperienced to cope with easily. From top to bottom the quality of the S3 Cabriolet is very impressive. Inside and out there is a strong feeling of robustness and high quality and all the controls operate with impressive solidity. Audi models, particularly those wearing the S badge is positive although the S3 Cabriolet in particular may be seen as so expensive that it is only a car for the rich. 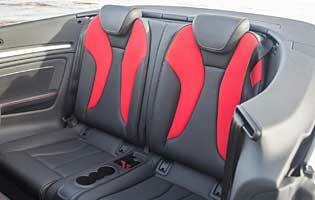 Access to the front seats is trouble free, but the rear pair can be awkward to stoop in and out of with the roof up. While a degree of compromise is to be expected in terms of rear seat access, the nature of the boot aperture means items at the back can be difficult to retrieve. As expected on a high specification car such as this the S3 Cabriolet uses the standard 5.8-inch display screen which is crystal clear, the audio system is easy to use with the MMI controller and the sound quality is impressive with Bose audio and further upgrades available. As with the hatchback the S3 Convertible is offered with a wider choice of colours that are not all available on regular A3 models. Careful consideration is required however to take into account the choice of three hood colours too. On the inside there are flashes of trim that can be finished in aluminium, carbonfibre-look material or piano black, all of which add to the quality feel. With a smaller window in the S3 Cabriolet's canvas roof there is a slight loss of rearward visibility compared to the hatchback, but with rear parking sensors as standard and relatively compact dimensions the S3 Sportback is little more challenging than the hatchback. Petrol engine options - 1.4-litre (122bhp, 140bhp); 1.8-litre (180bhp); 2.0-litre (296bhp) Diesel engine options - 1.6-litre (105bhp); 2.0-litre (150bhp). Transmission options: Six-speed manual or seven-speed dual clutch S tronic fitted as standard depending on engine. Trim levels: SE, Sport, S line and S.